"I’m at the Sunderman Conservatory of Music, studying vocal performance." "I started at age 5 singing with the Children’s Chorus of Maryland and taking musicianship classes." “Staging my first opera, Dead Man Walking, with Baltimore Opera. I was 7 (so not exactly age-appropriate material) but definitely an experience I’ll never forget." "Low Country Haze by Dan Viscotti. I saw it last year at the BSO, and it’s astounding how accurately the piece represents its inspiration, which is Lewis & Clark and crew’s depictions in their journals of their explorations. Some really cool new music." "A Clockwork Orange. Creepy? Yes. Compelling? Yes." ​“Dinosaurs, but only the ones that were herbivores"
What were you doing during the summer when you were in middle school? “I used to do this challenge in middle school where if you read 100 books over the summer, you won a prize, so probably reading." What's your favorite thing about singing in Lux? "Everyone who sings with Lux is not only very talented but also so excited and passionate about what the group does, and it’s fun to be surrounded by that." What's your favorite song you've sung with Lux? "I loved singing She Walks in Beauty​ [by Paul Mealor]. Just really cool melodies and a beautiful setting of really intimate poetry." ​What's the most interesting fact about you? Austin Nikirk is looking forward to her fourth season with Lux. She is a junior at the Sunderman Conservatory of Music, studying Vocal Performance. At the conservatory, Austin is a member of the College Choir and Audeamus treble voice ensemble, and studies in the studio of Dr. Susan Hochmiller. This fall, Austin studied abroad in Paris, France, at the École Normale de Musique, in the studio of Madame Sylvie Valayre. 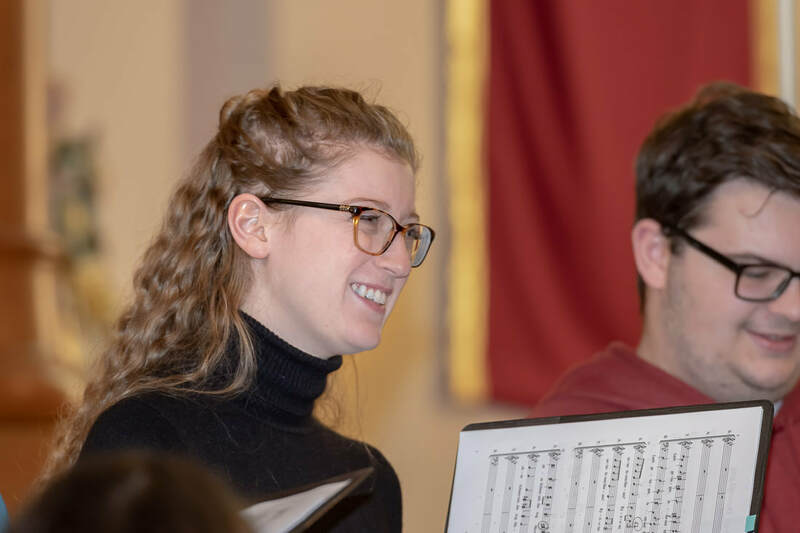 Austin has sung in choirs since she was 5 years old, starting with the Children’s Chorus of Maryland under Betty Berteaux, and, upon graduation, the American Kodály Children’s Chorus. Austin also was a soprano in the Second Presbyterian choir, under conductor Philip Olsen. As a soloist, she has sung in eight operas, and had roles in three: Cis in Albert Herring, the First Witch in Dido and Aeneas, and Adele in Die Fledermaus. Old Maid and the Thief/Speed Dating Tonight!